His address did not answer the essential question for Republicans in 2016: Will those who oppose Trump as a candidate for the nomination oppose Trump as the nominee? It was a high bar, but Mitt Romney met the challenge. The failed 2008 candidate for the Republican presidential nomination, the failed Republican nominee for the presidency in 2012, and the guy who toyed with running again in 2016 but thought better of it, has delivered the most pointless speech of the 2016 presidential race. Romney dominated the discussion following the Super Tuesday primaries and caucuses that saw Donald Trump dramatically advance his candidacy for the nomination of the party that made Romney its standard-bearer four years ago. Justifiably concerned about the direction of a party that his father helped to define in the mid-20th century and that he hoped to define in the 21st, the former governor of Massachusetts signaled that he would identify the danger posed by Trump and challenge Republicans to halt the rise of a crude, xenophobic, and reactionary billionaire who could turn the Party of Lincoln into the Party of Trump. Romney fails to endorse an alternative to Trump. Why? The political and media elites, who have always taken Romney more seriously than the American electorate has, did everything they could to pump up the hot-air balloon, and then Romney popped it. Other Republicans have said they will not vote for Trump in November. But not Romney. But Mitt Romney did not say he would refuse to vote for Trump as the Republican nominee in the fall. Prominent Republicans who take seriously the threat Trump poses, not merely to their party but to their country, have done this: Congressman Reid Ribble of Wisconsin, former Secretary of Homeland Security Tom Ridge, and Massachusetts Governor Charlie Baker have done this. More Republicans are stepping up each day to put the good of the United States ahead of petty partisanship. So what were we left with? Romney has ripped Trump and said that he should not be the Republican nominee. If there was a Trump-versus-Clinton race, where would Romney stand? Who knows? He does not even endorse an alternative to Trump in the primaries, urging simply that Republican primary voters cast ballots for John Kasich in Ohio, for Marco Rubio in Florida, and for Ted Cruz somewhere. That line, coming from the very face of the Republican establishment, only reinforces Trump’s argument that he is the only real challenger to the party elites that Republican voters appear to be determined to reject. 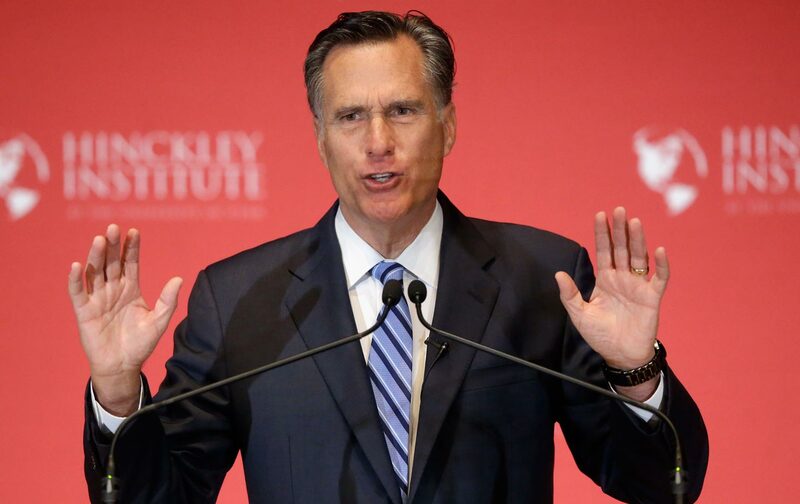 Cynics will argue that Romney simply wants to set himself up as that alternative. Perhaps. He pretty much ran for the presidency full time from 2005 to 2012 and he showed a good deal of interest in maintaining the permanent campaign into 2016—before finally deferring to the Jeb Bush juggernaut. But if we take Romney at his word that his speech Thursday was not an announcement of candidacy—as the pick of a brokered convention or as an independent “Lincoln Republican” alternative in November—then what are we left with? Next to nothing, because Mitt Romney’s speech did not answer what now quite likely will be the essential question for Republicans in the 2016 cycle: Will those who oppose Trump as a candidate for the party nomination oppose Trump as the nominee of the party?